Pipe Fittings Hammer Unions -Texas | Steel Supply, L.P.
Hammer Unions are fast acting connectors and commonly used in temporary flow-lines. 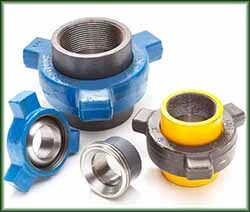 Hammer Unions consists of 3 pieces: a male connector with a spherical machined sealing surface, a female connector with a tapered machined sealing surface plus external threads, and a wing nut with internal threads. The wing nut fits over the male connector and screws onto the female connector, holding the two together and creating a seal between them.